Well it goes like this. A colleague mentioned he was interested in buying a hand made card for his wife for Valentines day and did I make Valentines cards to sell. 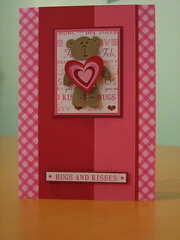 Always one to rise to the occasion when I got home I got out the cardmaking bits. (In truth, they never actually go away, at least not till the avalanches on my desk get so bad there’s not enough room for making). Anyway, a couple of busy evenings and I have produced a selection. This one is one of my favourites even if it is a bit cutesy. But then if you can be cutesy for Valentines Day when can you? Click on the photos link for the others I have made. A productive start to the new year. William’s birthday at the beginning of January makes a busy post Christmas crafting session for me. 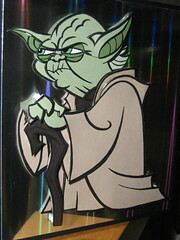 Both myself and William were thrilled with his Yoda card. It took me about six hours to do and was quite complicated in places to work out which layers need to go where. I found the image on the internet (I cannot claim to draw that well myself). It took 2 hours just to trace the design to use as the starting point of the card making. Each part of the design was then transferred onto the appropriately coloured card before being slightly shaped with an embossing tool and layered up using foam pads.I now need to find a frame to fit it as William wants to hang it on his bedroom wall. Click on my flickr link for more pictures. William has been pestering me for ages that he would really love to have a Jedi robe for dressing up in. Not that he is obsessed with Star Wars or anything. 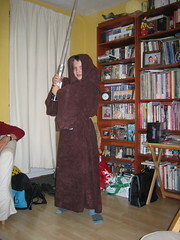 Up till now his jedi robe has been a yellow and orange tweety pie dressing gown that he has had since he was about 4. Well you can imagine can’t you? He’s ten now so to say it was a bit small is a bit of an understatement. Anyway, a few weeks before Christmas I found some material in Hobbycraft that was £2.99 a metre and looked just right for the job. It’s a faux suede finish fabric and looked like it would drape and hang really well. What with redecorating the kitchen just before Christmas the time wasn’t there to get it made. Unfortunately for William though he went back to school on his birthday. Not great for him but it did give me a six hour window so I thought I’d give it a go. So, armed with some sketches I found on the internet I set about making a pattern. I got a roll of cheap plastic banqueting roll from the local cheap shop and set to. Fortunately the amount and width of the fabric meant I was able to make a pattern that could make the robe out of one piece. I was amazed how easily the whole thing went together. It’s funny how some projects just seem to work isn’t it? The most complicated bit of it was the hood but by being methodical and spending a little extra time pinning it in place it went together really nicely. Lastly I covered the rough edges where the hood met the cloak with a spare piece of cloth and bingo! It was done. I couldn’t wait for William to see it so wrapped it up and took it with me up to school in the afternoon. As you can see from the pics he is rather happy with it and the tweety pie dressing gown can be finally put into retirement where it should have gone a long time ago. A final bonus was that amazingly it was the perfect size for him. The sketchy instructions I had were for someone of 5′ 5″ tall so I adjusted the size a little when I made it by estimating how much shorter than me he is and drawing the pattern up accordingly.